One of the oldest dolphins in Sarasota Bay died on June 7 after ingesting fishing gear. This loss serves as a reminder to protect marine life while enjoying our coastal waters and beaches all year around. Squiggy was first identified in September 1980 and was documented 267 times since then by the Sarasota Dolphin Research Program (SDRP) – a collaboration between Mote Marine Lab and Chicago Zoological Society. SDRP staff have continued monitoring Squiggy’s descendants, who have also suffered human interactions. Squiggy’s daughter died in 2012 from ingesting recreational fishing gear, and the daughter’s six-month-old calf died several weeks later from losing her mom. Squiggy’s first grand-calf died from entanglement in a crab trap’s float line. 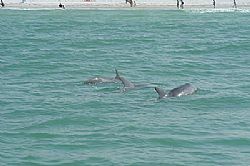 Currently, the dolphins of Sarasota Bay are at the height of calving season. Five babies have been born this year and one was lost for unknown reasons. During this time of year, it’s more important than ever to be vigilant for dolphins.